Back in the Summer, I had a huge ‘why-didn’t-I-think-of-that?’ moment. We had some friends come to stay for the weekend with their 2-year-old girl Sofia. I love having other children in the house. Mostly because it’s so fun to see how Fergal and Finbar interact with them. But also because I like to see what other kids will (and won’t) eat. I often get great ideas for new things to try with my boys. Like this muesli. Anyway, given that I used to design muesli (and other breakfast cereal) for a living back in my old food science days, I lept at the chance to have a crack at making a natural muesli. Plus it was a great way to get Fergal involved in this new breakfast idea. Of course, the added incentive of sultanas (raisins) didn’t hurt. Making your own muesli is so much fun. Plus unlike commercial muesli makers, you can focus all your money on using the best quality and quantity of tasty ingredients. No need to have conversations like, ‘we can only afford 0.005% almonds’. And no need to allocate any of your museli budget for packaging, marketing or distribution. And you get to make it exactly how you like. Endless possibilities! This is really more of an idea than an actual recipe. I love that each batch is slightly different based on what we have and how heavy handed my ‘kitchen assistant’ is. I keep my muesli mix separate from the dried fruit because it gives everyone the ability to control their fruit quantity. Plus it avoids the moisture transfer problem of the oats getting soggier and the fruit getting harder during storage. But if it makes life easier, you can store them in the one jar. Keeps for 6 months+ in the pantry, provided your ingredients aren’t too old. enough for: as many as you like! 1. 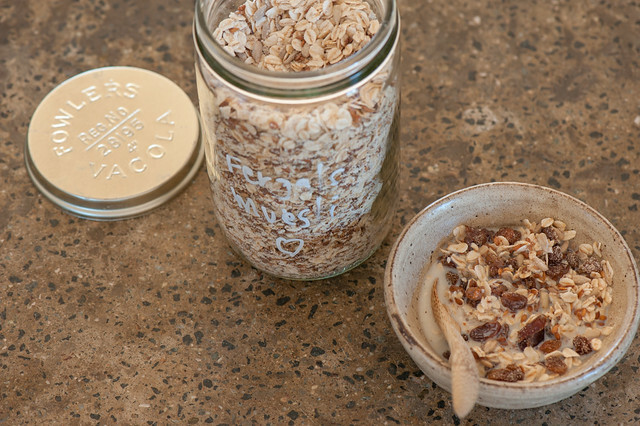 Fill a glass or other large jar about half way with your oats. 2. Add your choice of seeds and nuts, mixing as you go. There’s no wrong way to do this. I generally pop the lid on and shake to mix but a spoon can work as well. 3. 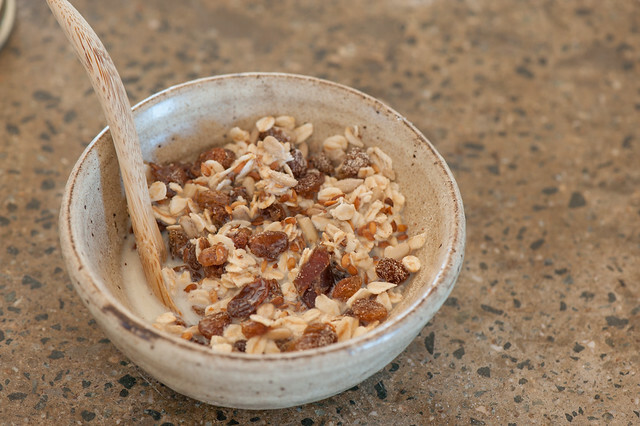 Serve your personal muesli in a small bowl with fruit (if using) and milk or yoghurt. different oats – I started using quick or instant oats because they’re the easiest for little mouths, but my last batch was using regular (traditional) rolled oats and everyone was still able to eat them. Steel cut oats are the least processed and have the lowest GI but are also the hardest to chew! different nuts – I usually use almond meal so there’s no choking hazard to worry about, but any whole or chopped nuts will work. I like to be generous with the nuts because they add good fats and some protein and make the muesli even lower GI. different seeds – linseeds (flax) and sunflower are our favourites. But feel free to add pumpkin seeds (pepitas) and chia if you like. Seeds are awesome because they tend to be less expensive than nuts but still give that satisfying flavour and interesting texture. different fruit – I make up a dried fruit mix of sultanas (raisins), chopped pitted dates and chopped prunes that we keep in a separate jar and add before serving. Any dried fruit is great but the boys do love their sultanas. Dried apricots and apples make a lovely fancy change. You can also serve with fresh fruit. wintery – serve with warm milk or use your oat / seed / nut mix to make a porridge (oatmeal). bircher museli – soak oat mix over night in milk or water. Stir through grated apple and serve with more milk or some yoghurt. higher fiber – replace some of the oats with oat bran, psyllium husks or other bran. Be generous with the seeds too! low carb – replace the oats with finely sliced almond flakes or flaked coconut (or a mix of both). Like my paleo Coconut & Almond ‘Cereal’. extra crunchy – serve with some Chocolate Granola or Peanut Butter Granola. Like to discover my ‘secret’ for actually enjoying getting dinner ready? Wish it was easier (and more fun) to get dinner on the table night after night? 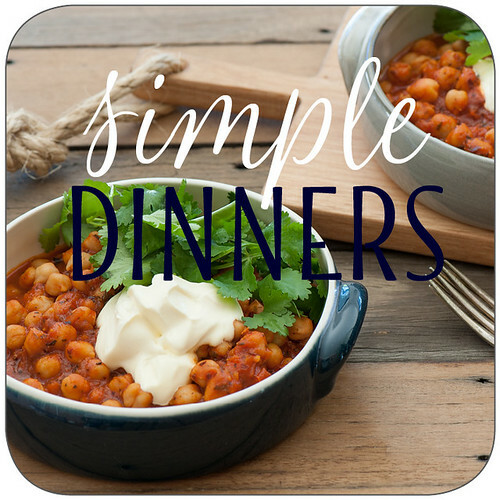 Then have a look at my ‘Simple Dinners’ online cooking program. I think the oat groat is the least processed but you would probably break your teeth if you tried to eat it as muesli. I tried to make porridge from oat groats once. I soaked it for 3-4 days and cooked it for at least an hour and it was still very crunchy. Steel cut oats make very nice porridge. I don’t think I need oats processed than steel cut oats. You’re right Gina… the whole groat is the least processed but definitely hard to chew! So glad you liked it Reena!